A unique aspect of the great helm was that, as it evolved, its size allowed for it to be worn over a light helmet. This Royal Over Bearer Great Helm is one such example of helm that, historically, might have been worn with a secondary helm underneath. Of course, this recreation can be worn singly, as a stand-alone, and indeed, it is designed to be worn as such (although those who have a small enough secondary helm can layer the two, if they like). The reason for this double-layering of helms was simple - this way, you could discard the great helm if it became too hot or too stifling, and still keep some defense for your head! This particular great helm is classic in its pot-design, possessing a round, cylindrical shape with a subtly peaked top and swelled sides. The sides of the helm are reinforced with rivets and strips of metal, while the face features narrow rectangular eyelets, as well as two small star cut-outs near the elongated front rim. 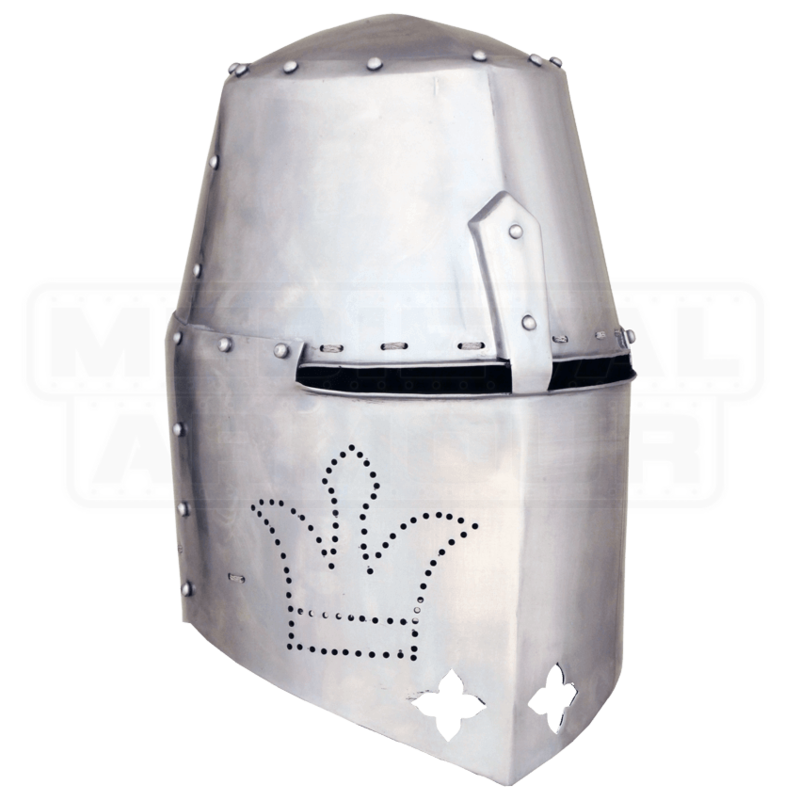 Also adorning the helmets front is a crown pattern, made up of small punched-out holes. The helmet is offered in one size, and it also features internal padding, for added comfort when worn. It is also offered in two models - the 18 gauge version is light and suited for casual and costume wear, as well as for LARPing and light combat, while the 14 gauge model is much heavier and well-suited for the rigors of more intensive reenactment and SCA combat. 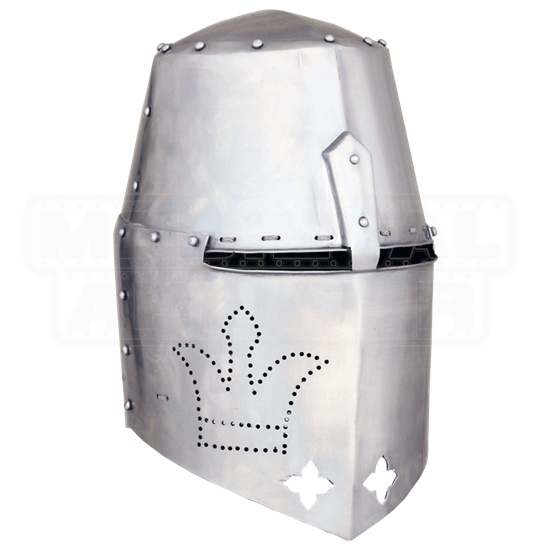 In either model though, this Royal Over Bearer Great Helm remains a fine specimen of medieval and crusades era protection, one that any warrior would be glad to wear into battle.